Babaji is an immortal avatar who was born on the eastern coast of India in 203 AD as the boy Nagaraj. The story goes that he was kidnapped by pirates as a child and sold into slavery. His owner recognized special gifts in the boy and released him to wander and study. He was initiated in Kundalini Yoga by the greatest teacher of that time. While still in his teens, he achieved immortality through the practice of Siddha Yoga and Siddha medicine. Babaji added his enhancements to Kundalini Yoga, renaming it Kriya, and gave us the powerful Cosmic Cobra Breath, his most precious gift to humanity. "Babaji" is a title, meaning "honored father" a title used by many spiritual leaders. The immortal Babaji Nagaraj is unique, not to be confused with others. Babaji is called the MoolaGuru ~ expert of Mooladhara, the root chakra and seat of Kundalini. He has taken responsibility for the yogic education of the souls incarnated on Earth. He encourages and supports anyone who wishes to become a Babaji. His presence brings a sense of great comfort, that all is well and that you are protected and appreciated. It is the energy of pure unconditional love. To attune yourself to Babaji you can do so through the Kriya practices, gazing at the yantra that represents his energy, meditating on his image or by repeating the mantra that invites that energy into your being: "Om Kriya Babaji Namah Aum." 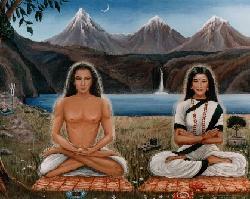 Babaji lives in an ashram high in the Himalayas, said to be a shangri-la with meadows, waterfalls and perfect climate. He lives with his beautiful consort Mataji, who has also attained immortality. She is referred to in most Kriya systems as his sister but, acknowledging Babaji as a tantric master, we recognize her as his partner.